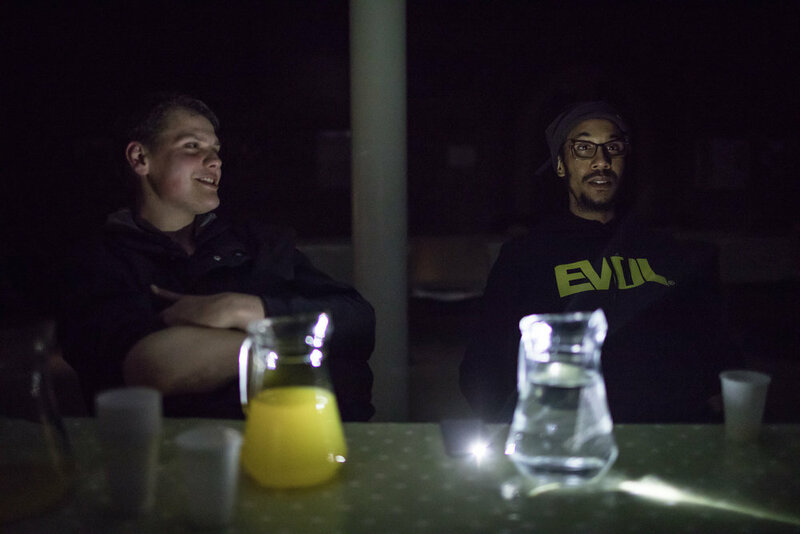 I spent a night at a winter homeless shelter in Wandsworth, run by the charity Glass Door. I wanted to understand why rough sleeping in England has risen so relentlessly since 2010 – up 16% last year and 30% the year before. 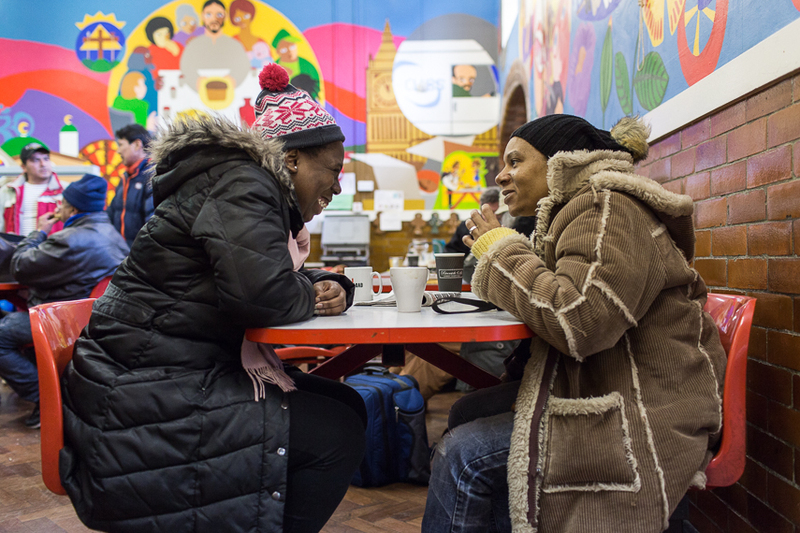 I talked to guests, staff and volunteers about the disparate problems that had brought people there, the Government cutbacks that are making the situation worse, and what life on the streets of south London is really like. WHEN I arrive at St Mark’s, Peter is already waiting outside. We nod hello to each other and then Ben, Glass Door’s Night Shelter Manager, lets us in. It’s 6.30pm, an hour and a half before the doors officially open, and the volunteers are busy preparing for the evening’s guests. 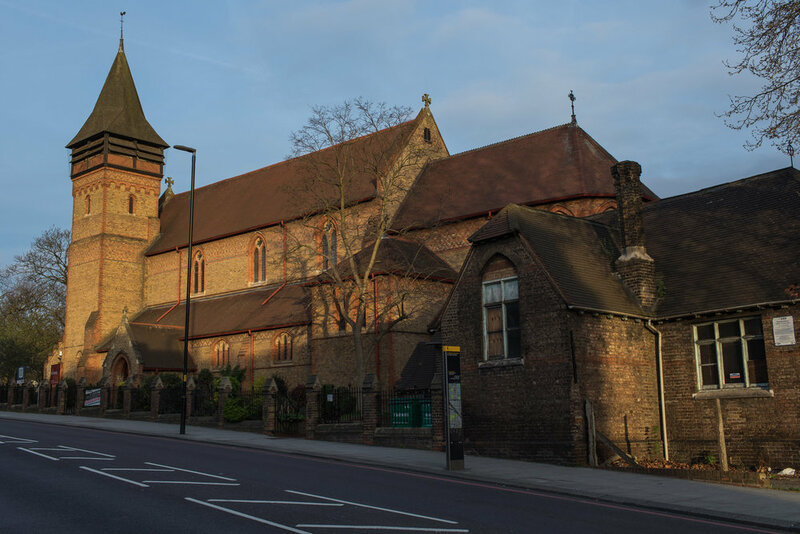 There are seven churches on this borough’s circuit, each responsible for one night of the week. It’s a simple set up: sleeping bags and mats on the floor, coffee, tea, dinner and breakfast, in and out in 11 hours. Ben is overseeing tonight’s programme, but volunteers will cook and serve the food. 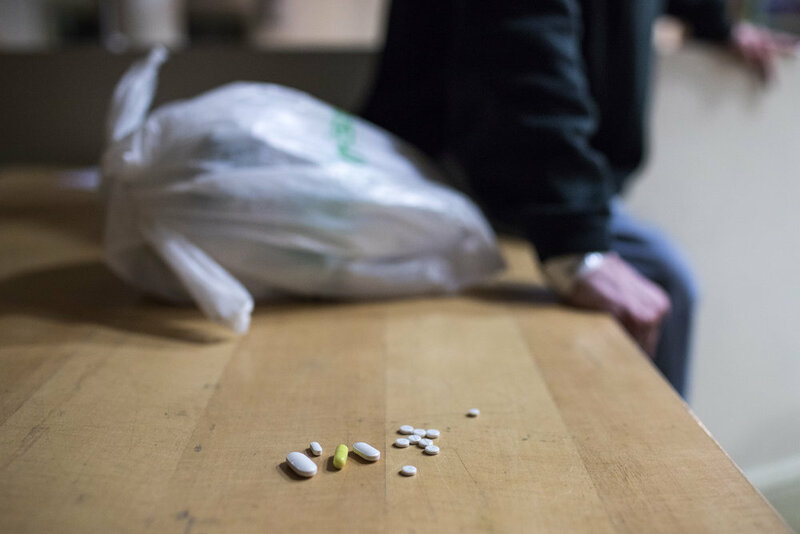 What makes Glass Door different from some other winter shelters is that they will take pretty much anyone – including drug addicts, people with profound mental health problems and ex-offenders with a history of violence. Some temporary shelters, including Lambeth’s equivalent scheme, Robes, are run entirely by volunteers. They provide a vital service, but they’re not equipped to manage the highest risk clients. Glass Door’s model is to be open to all, and so they hire paid, trained staff, as well as recruiting volunteers, so that they can accept more challenging referrals. I learnt about Glass Door through Ace of Clubs, the day centre for homeless people in Clapham where I’ve spent time over the last couple of years. They regularly refer people to Glass Door, including those the other shelters won’t take. As the sun goes down over the South Circular, it’s a relatively warm March evening. There will be no frost tonight. But the improvement in the weather is bittersweet for the guests here. It marks the end of winter shelter season. Nine days after my stay temporary shelters like this start to close across the capital. Those guests who haven’t found housing will go back to sleeping on the streets. There are a few shelters that open year-round, but they are heavily oversubscribed and Government cuts to local authority budgets have ensured that what beds remain are declining. Follow-on accommodation – bridging the gap between shelters and proper tenancies – is now almost non-existent in London. 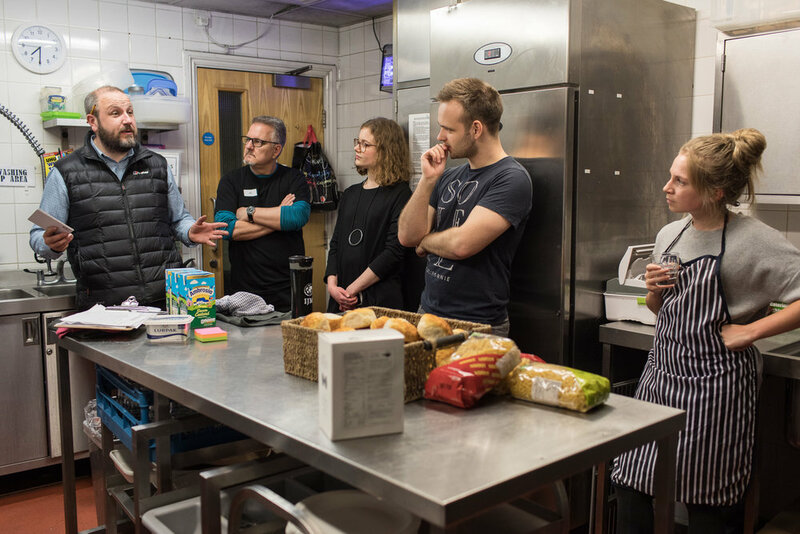 While the volunteers lay out tables and cook tonight’s dinner – tomato soup, spaghetti Bolognese and bread and butter pudding – I talk to Peter. He’s 61, has chronic emphysema and has suffered several heart attacks. Every day he has to take 24 tablets and use two inhalers. In the two weeks since he first came to Glass Door, he’s been hospitalised three times. Peter was born in France but moved to the UK with his family when he was three. He lived and worked here for more than fifty years before he moved back to France when his aunt, who he’d cared for, died. But his health rapidly deteriorated, and he ended up in a coma in a Calais hospital for a month. Uninsured, he racked up huge medical bills, which wiped out his savings, leaving him with just £200. Unable to pay his rent and not knowing what else to do, he packed a bag and took a ferry back to the UK. That was a month ago. “I caught the coach to Victoria and I stood there, in Victoria Station, thinking ‘what the hell do I do now? I’m 61 years old. How has it come to this?’” That first night he slept under a motorway bridge because he was too scared to sleep out in central London. The next night he collapsed and was rushed to St Thomas’ hospital. When they let him out, they referred him to Glass Door, and he’s been a guest ever since – albeit with three further stints in hospital. The doors open just before 8pm and tonight’s guests file in. Volunteers offer hot drinks and hand out name badges, although most people seem to know each other already. Some are laughing and joking, others shuffle up the stairs in silence. One man is clearly very unwell and sits down on the floor clutching his stomach. 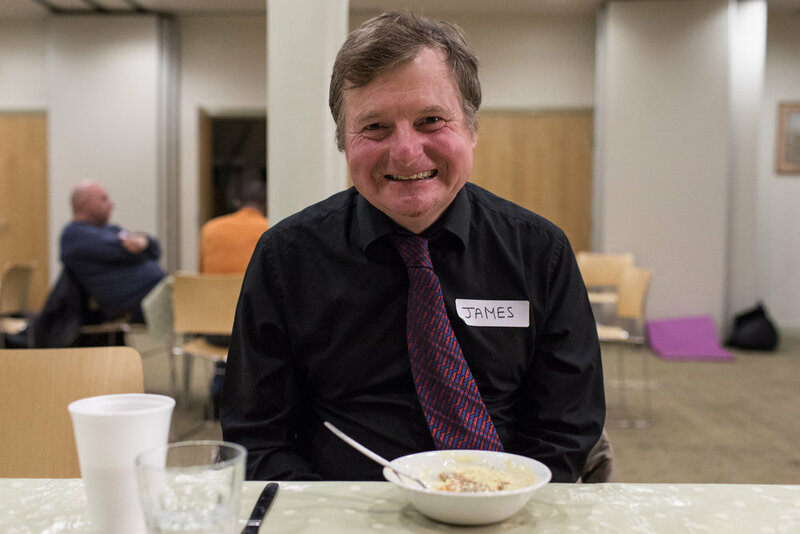 Ben introduces me to James – smartly dressed in a shirt and tie, smiley and chatty. He looks far removed from a stereotypical vision of a homeless person. He’s 56, and started sleeping rough in November last year. Sometimes he gets work, sometimes he doesn’t. The night we meet he has a job on a site in Croydon the next day. But he’s not earning enough to afford regular accommodation yet. Ben isn’t the only person I speak to who’s working tomorrow. After dinner, I meet Herve, a 58-year-old antiques dealer from France. He was in the process of setting up a business importing artefacts from Mali when war broke out. He lost everything and fled to the UK with his English partner. Their relationship then broke down and he ended up sleeping rough for nine months. After dinner, people plug in their phones and unroll their sleeping bags. 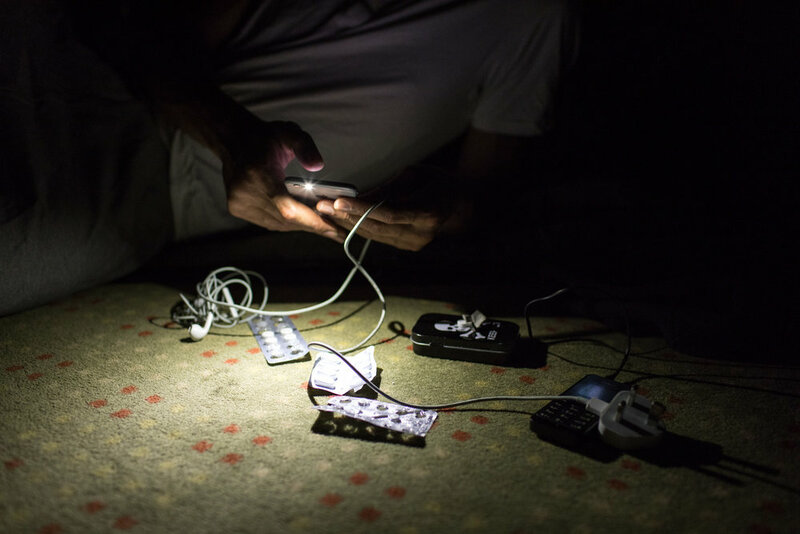 I notice a few power bricks – a vital accessory if you’re expecting calls from employers but don’t know when you’ll next be able to access electricity. A few people stay up chatting, or go for a last smoke outside, but most bed down early. Shortly after 10pm, the lights go out. Ben and I continue talking quietly by the light of his phone. Slowly, as people nod off, the cacophony begins. It’s an extraordinary sound – a chorus of roaring snores, hacking coughs, jitters, spasms and rustles, and people talking, moaning and even shouting in their sleep. All par for the course here. “Sometimes you almost want to stay out there it’s so bad,” Ben says. By 11pm, we’re all down. As part of my initiation, Peter and Ben have placed my mat next to the room’s worst snorer. They say they want me to get the authentic Glass Door experience. “It takes a couple of weeks, but then you get used to it,” Ben assures me. But of course despite the fact that I get no sleep at all – my ear plugs prove no match for my neighbour’s sinus problems – there is nothing authentic about my stay at St Mark’s. I get to go home afterwards. When the lights come on at 6am I notice several berths have already been vacated. James has left for a temp job, Herve is setting up his stall. As I tuck into toast and a cup of tea, I’m introduced to Sam, from Brixton. Two days ago he was released from prison after serving 10 years for robbery. He tells me he has longstanding problems with his mental health and addiction. In the past, when prisoners were released they were offered temporary accommodation to help them reintegrate into society, and reduce the chances of them reoffending. Those days are largely gone. When Sam got out, there was nowhere for him to go. He spent two nights sleeping outside a supermarket before being referred to Glass Door by his probation officer. By 7am we all have to be out. The church resumes its normal functions. Some people will join the commuters and go to work. 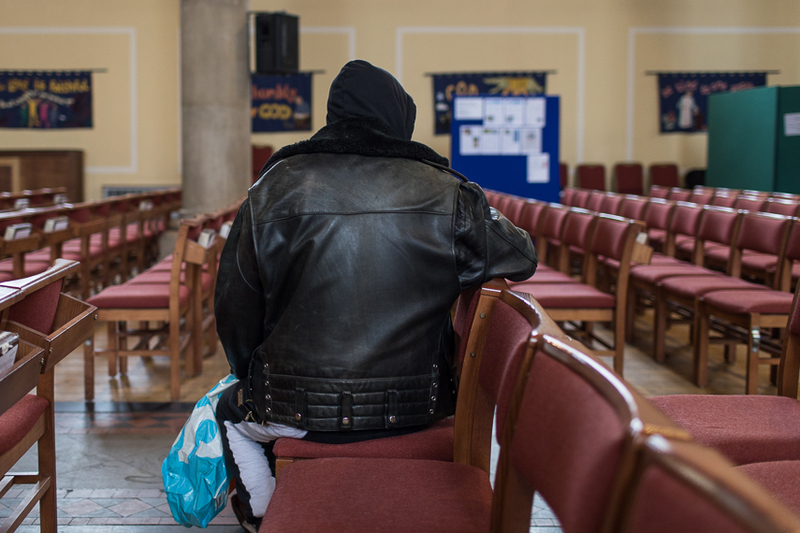 Many, like Peter, will simply wander the streets until day centres like Ace of Clubs open, where they can shower, wash their clothes and eat lunch. They close at four, so then it’s more wandering until Glass Door reopens at 8pm. I head back to my bed. To my shower. My fridge. My roof. Things I take utterly for granted. That homelessness exists at all in a country with the fifth largest economy in the world is shameful. That it is growing so quickly, propelled by Government policy, is a scandal. Glass Door gets no Government funding. Neither does the Robes project in Lambeth. And yet local authorities increasingly rely on shelters like these to fulfil their statutory responsibilities to house people, relinquishing what little accommodation they still have to plug the holes in their budgets that austerity has created. It is not a sustainable situation.